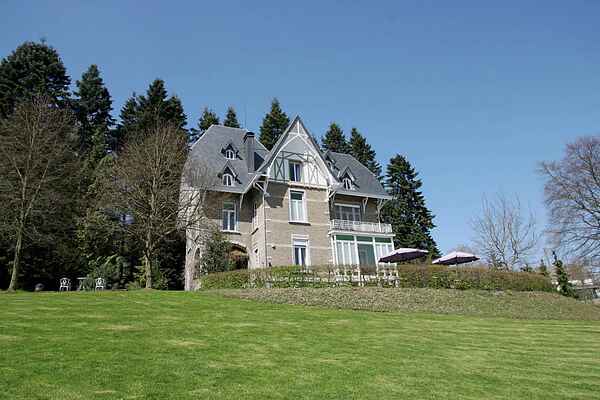 This beautiful mansion with spacious garden is situated on the verge of the village of Stavelot. The house is equipped with all amenities and decorated very stylishly, perfectly combing antique and modern. There are as many as three cozy, spacious living rooms in this mansion. Formal dining is possible in the wooden living room, but also in the cozy open kitchen. There's a second kitchen with dining facilities, a little bar and a football table. In the home, you'll find party games and a piano which guarantee a cozy afternoon or evening. The terrace with barbecue is equipped with long tables and offers enough space for large companies. It also offers a panoramic view over the village. There's a big lawn with playground equipment, a playhouse and a soccer goal for children. The house is ideally located to discover the Ardennes. The center of Stavelot is 1.5 km away, where you'll find the abbey and the car museum. At a distance of 3 km, you'll find Coo with the waterfalls of Coo and Plopsacoo, and the Circuit of Francorchamps is at a distance of 7.5 km from the mansion. Moreover, there are several ski- and cross-country ski slopes in the area.